If you have had a chance to buy a retail bag of barismo coffee, you may have noticed that we fit quite a bit of information onto a small amount of real estate. The reasoning behind this is two fold: first of all we think that all of these small details contribute to the final product, secondly, we believe that transparency is the only path to improving any of these variables. We in effect are making ourselves accountable to you, the recipient of that cup of drip coffee, or shot of single origin espresso, or cup of cold brew. Below is a bit of information from our green buyer Silas Moulton talking about one of our Direct Trade buys this year from El Salvador, La Fatima. Carmen Duch Martinez is a third generation coffee farmer who owns and manages the beautiful coffee estate, La Fatima, located in the Santa Ana mountain range in eastern El Salvador. Working together with her brothers Rafael and Juan (whose farms have also won cup of excellence) she has produced spectacular coffee for many years and placed in the Cup of Excellence competition four times earning third in 2009. La Fatima is located along the Santa Ana volcano, which is also known as Ilamatepec. In Nahuatl, a dialect of Aztec, Ilamatepec means “father hill” and is believed to watch over the crops grown on the hillsides. This is one of the premier coffee growing regions in El Salvador and certainly the most well known region. The weather conditions here are ideal for growing coffee with an average temperature of 21°C, 2.4 meters of annual rainfall, and a dry season with little rain which promotes even flowering and drying of the coffee. Fatima is made up of mature bourbon trees covered by plenty of shade which is mostly ingas. There is also a small amount of Typica grown on the farm. Carmen prefers to aim for quality of growth instead of yield and avoids the use of chemical fertilizer and pesticides. The shade, older coffee trees, and infrequent use of chemical fertilizer leads to slower growth and does in fact cut yields quite a bit, but increases the concentration of the flavor as the tree puts more energy into fewer offspring. 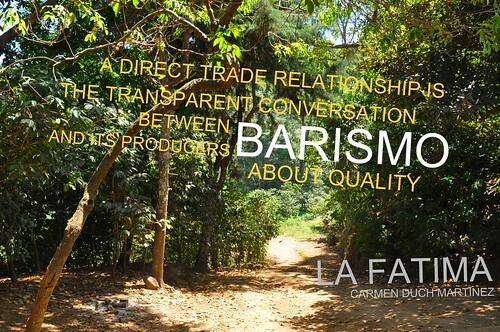 I first cupped La Fatima at the Cuzcachapa Co-op mill in March of 2011. This large co-op dry mills and exports coffee for more than 1,400 member farms in the Santa Ana area. It was my favorite coffee I tasted that trip. After some shipping issues and a sharp drop in quality because of this, we were not able to offer this coffee last year. I went back to Cuzcachapa again this year and again it was my favorite coffee. I pushed for earlier ship dates and we are able to add this coffee to our menu unharmed.